Join us for a divine night of chanting with Kamini Natarajan! 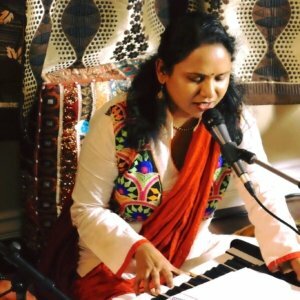 Kamini Natarajan is a Kirtan singer and Indian Classical Vocalist from India. She comes from a family of devotional singers. She started learning intricacies of Ragas and complex taal patterns as a young kid and later went on to graduate in Indian Classical Music. Kamini currently lives in Simi Valley, CA where she teaches, performs and records Indian Classical Music, Kirtans and World music. She is the organizer of Simi Valley Kirtan MeetUp Group. Her music is spiritual, mystical and engaging. She incorporates intricate Ragas and traditional rhythm patterns – “Taals” that lifts listeners into a higher state of consciousness- a state of pure bliss, away from day-to-day stress.